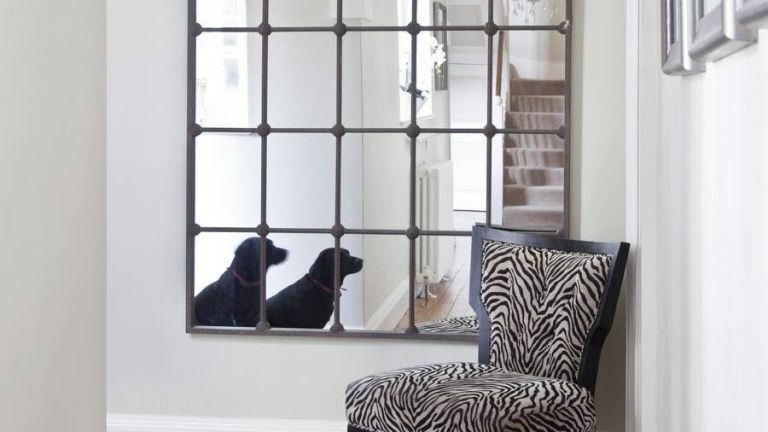 Creating the illusion of both space and light while providing an eye catching design feature (not to mention being a spot for last minute outfit checks) mirrors have the power to transform a hallway – whether you're designing your hallway from scratch or simply want to inject a new lease of life. From industrial metals and salvaged-looking window mirrors to on-trend copper frames and baroque-look pieces, there's a style of mirror to suit every space. Our edit of the best hallway mirrors is varied, but consistently high quality, meaning there's something to suit every space and style. Once you've chosen your mirror, why not browse through our 10 design ideas for hallways? This large statement mirror effectively combines style and utility, making it our favourite mirror for hallways. Its oversized window design reflects light beautifully, so it’s best placed opposite a bay window or door is you want to create the illusion of a larger, brighter space. The metal hardware is carefully neutral, neither warm nor cool, so it’ll fit into almost any scheme as long as there’s enough room on the wall. If you’re looking for a unique addition to a drab or dated hallway, this could be it. Copper and geometric lines give this Prisma mirror an Art Deco-inspired, standout feel. On the slightly smaller side, it makes for a great addition to a small or narrow hallway. Put this glowing metallic in your kitchen, too, with our favourite copper accessories. Positioned next to the front door, this oversized hallway mirror would make the perfect addition to a large hallway. In addition to elegantly reflecting light throughout the space, this large mirror provides the perfect spot for last minute make-up and outfit checks. A great option for renters, this stylish mirror can simply be propped up against the wall, no screws required. Matt, metal and ever-so modern — what’s not to love? With its powder-coated steel frame, exposed bolts and clean lines, this metal mirror is perfect for industrial-inspired room schemes. Complete with a handy shelf, it makes the perfect addition as a spot for hallway storage – for keys and other small day-to-day essentials. Alternatively, use it to display a small house plant or simple ornament. This amazing baroque mirror is a clever meeting of elegant and opulent, adding a hint of richness to any hallway wall. If you have a true-to-period Victorian property, it would make a fantastic addition hung at the bottom of the stairs. Alternatively, it would work as a stand alone feature in a more contemporary scheme adding interest with its intricate moulding and lustrous cool-toned gold. We love the idea of making a design statement with this intricate mirror. While there are round mirrors aplenty on the market, including some of the lovely picks in our list, it’s the swirling wire frame of this mirror that sets it apart. Make sure that the space you have in mind is large enough not to be overwhelmed by this statement mirror. If you’re working with an otherwise uninspiring space or particularly cramped hall, this is an easy way to inject a bit of personality into a space.